What’s going on? Clothes dryer is taking forever to dry; it is over 2.5 hours, but the clothes are there wet! The settings seem to work, and the dryer turns and even heats, but the clothes don’t get dry. You have to go through 3 or 4 cycles to get the clothes dry. And, by the way you had just cleaned the lint filter from buildup of lint (which you have to do after each and every load! ), cooled your dryer down and when it is on, again heating but not drying the clothes. dryer and is connected to outside flap of the house. Slide the dryer forward very carefully so you can get behind it. 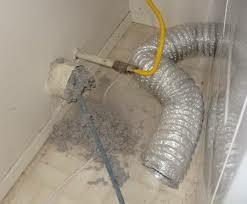 Locate the (usually silver colored) air vent hose, and remove it from the wall. Sometimes small animals make nests in them, or they can accumulate dust. There is a filter in the vent when it exits the house. It should also get removed and cleaned twice a year. The second connecting point on the dryer itself. Lent also gets there. 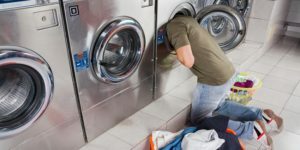 It could be a little hard to do the whole task by yourself and, since you understood that it is vent hose clogging problem, call out the plumber!